Hassanshahian, O., Javanmardi, J., Behroozbeh, M. (2014). Effects of Various Rates and Concentrations of N-P-K on Growth ‘Rio Grande’ Tomato Seedling. 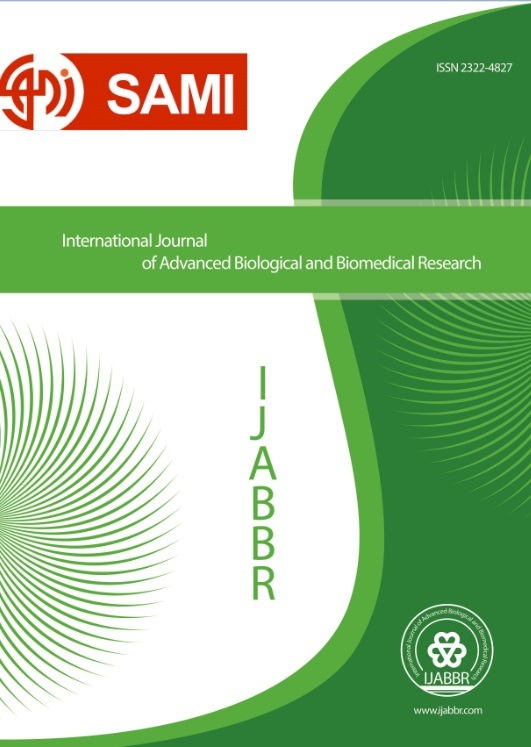 International Journal of Advanced Biological and Biomedical Research, 2(3), 579-585. Ozra Hassanshahian; Jamal Javanmardi; Mohammad javad Behroozbeh. "Effects of Various Rates and Concentrations of N-P-K on Growth ‘Rio Grande’ Tomato Seedling". International Journal of Advanced Biological and Biomedical Research, 2, 3, 2014, 579-585. Hassanshahian, O., Javanmardi, J., Behroozbeh, M. (2014). 'Effects of Various Rates and Concentrations of N-P-K on Growth ‘Rio Grande’ Tomato Seedling', International Journal of Advanced Biological and Biomedical Research, 2(3), pp. 579-585. Hassanshahian, O., Javanmardi, J., Behroozbeh, M. Effects of Various Rates and Concentrations of N-P-K on Growth ‘Rio Grande’ Tomato Seedling. International Journal of Advanced Biological and Biomedical Research, 2014; 2(3): 579-585. Tomato (L.ycopersicon esculentum Mill.) cv. Rio Grande seedlings were nutritionally conditioned with solutions complete fertilizer N(60% NO3+40% NH4)-P-K (20-20-20) , N(30%NO3+70% NH4)-P-K (15-5-30) , the first two week N(60% NO3+40% NH4)-P-K (20-20-20) and later two week N(30%NO3+70% NH4)-P-K (15-5-30) and vice versa were applied in completely randomized experiment with three replications to determine the effect of nutritional regimes on tomato transplant growth. As nitrate rate increased from 30% to 60%, fresh shoot weight, plant height, stem diameter, leaf number, leaf area, shoot and root dry weights, and total chlorophyll increased. in the 750 mg/lit of N( 60% NO3+40%NH4 )-P-K (20-20-20) were decreased and it is with to increasing in stem diameter and total plant growth , application of N(60%NO3 + 40%NH 4 )-P-K(20-20-20) in the first two weeks of seedling growth and N(30%NO3+70%NH4)-P-K (15-5-30) in the last two weeks in the concentration of 200 mg/liter seedling height decreased. Ahn O, P.R.J., Harrison, P. J. (1998). Ammonium and nitrate uptake by Laminaria saccharina and Nereocystis luetkeana originating from a salmon sea cage farm. Journal of Applied Phycology, 10: 333-340. Berghage, R.D., Heins ,R.D. (1991). Quantiﬁcation of temperature effects on stemelongation in poinsettia. Horticulture Science, 116: 14–18. Cao C L, L.S.X. ( 2003). Effect of N form on the accumulation of carbohydrate and nutrients of corn seedlings. Journal of Huazhong Agricultural University, 22: 457-461. Claussen, W. (2002). Growth, water use efficiency, and proline content of hydroponically grown tomato plants as affected by nitrogen source and nutrient concentration. Plant Soil, 247: 199–209. Fan M S, S.Y.Q., Shao, J. W., Jia, L. G. (2005). Influence of nitrogen forms on oat growth and phosphorus uptake. . Acta Agronomic Sinica. 31: 114-118. Forde, B.G., Clarkson, D. (1999). Nitrate and ammonium nutrition of plants: Physiological and molecular perspectives. . Advances in Botanical Research ,30: 1-90. Gaston, M.L., Konjoian, P.S. , Kunkle, L.A. and Wilt, M.F. (2001). Tips on regulating growth of ﬂoriculture crops. O.F.A. Services, Columbus. Gerendás J, Z.Z., Bendixen, R., Ratcliffe, R.G., Sattelmacher, B. (1997). Physiological and biochemical processes related to ammonium toxicity in higher plants. Zeitschrift für Pflanzeneruährung und Bodenkunde, 160: 239-251. Günes A, I.A., Aktas, M. (1996). Reducing nitrate content of NET grown winter onion plants by partial replacement of NO3-N with amino acid in nutrient solution. Scientia Horticulturae, 65: 203-208.
hrr, W.G., Llunnrn, V. N., lNo HIxcrrev, T. M. (1979). Effects of Cycocel and nitrogen form on tomato water relations, ion composition, and yield. Plant Science, 59: 391-397. Imas P, B.-Y.B., Kafkafi ,U., Ganmore-Neumann ,R. (1997). Release of carboxylic anions and protons by tomato roots in response to ammonium nitrate ratio and pH in nutrient solution. Plant and Soil,191: 27-34. Kadri Bozokalfa, M.( 2008). Short communication. Irrigation temperature effects on seedling growth and transplant quality of tomato, pepper and eggplant. Spanish Journal of Agricultural Research , 6(1): 120-124. Latimer, J.G. (1991). Mechanical conditioning for control of growth and quality of vegetable transplants. Hort Science. 26: 1456-1461. Marschner, H. (1995). Mineral Nutrition of Higher Plants . (2nd Edn),. Academic Press, London UK, 889pp. Melton, R.R., and, Dufault, R.J. (1991). Nitrogen, phosphoru and potassium fertility regimes affect tomato transplant growth. Hort Science, 26: 141-142. Nishihara G N, T.R., Noro, T. (2005). Effect of temperature and irradiance on the uptake of ammonium and nitrate by Laurencia brongniartii (Rhodophyta Ceramiales). Journal of Applied Phycology,17: 371-377. Raab , T., Terry ,N. (1994). Nitrogen source regulation of growth and photosynthesis in Beta vulgaris L. Plant Physiology, 105: 1159-1166. Sandoval-Villa M, G.E., Wood, C.W. (2001). Greenhouse tomato response to low ammonium nitrogen concentrations and duration of ammonium-nitrogen supply. Plant Nutrition, 24(11): 1787–1798. Schnelle, M.A., McCraw, B.D., and Dole, J.M. (1993). Height control for ﬂowering and vegetable transplants. Oklahoma State Univ. Extension Facts No, 7614. Smit, A.J. (2002). Nitrogen uptake by Gaillardia gracilis (Rhodophyta): adaptations to a temporally variable nitrogen environment. Botanica Marina, 45: 196-209. Styer, R.C., and Koranski, D.S. (1997). Plug and transplant production: A grower’s guide. Ball Publishing, Batavia, IL. Tayama, H.K., Larson, R.A., Hammer, P.A., and. Roll. T.J (eds.). (1992). Tips on the use of chemical growth regulators on ﬂoriculture crops. Ohio Florists’ Assoc., Columbus. Xu R Y, B.Z.L., Huang ,D. F.(2005) . Effects of different nitrogen forms on the dry matter accumulation and leaf nitrogen metabolism of muskmelon. Transactions of the CSAE, 21: 147-150. Bar-Yosef, B. (2008). Crops response to solution recycling in closed loop irrigation systems. In: Raviv, M., Lieth, J.H. (Eds. ), Soilless Culture: Theory and Practice. Elsevier, pp. 341–424.